An FTP account is used for uploading and managing files on your website. An FTP account is automatically created in VestaCP when you create a new domain which you can access with the same login credentials that you use to log into your VestaCP. 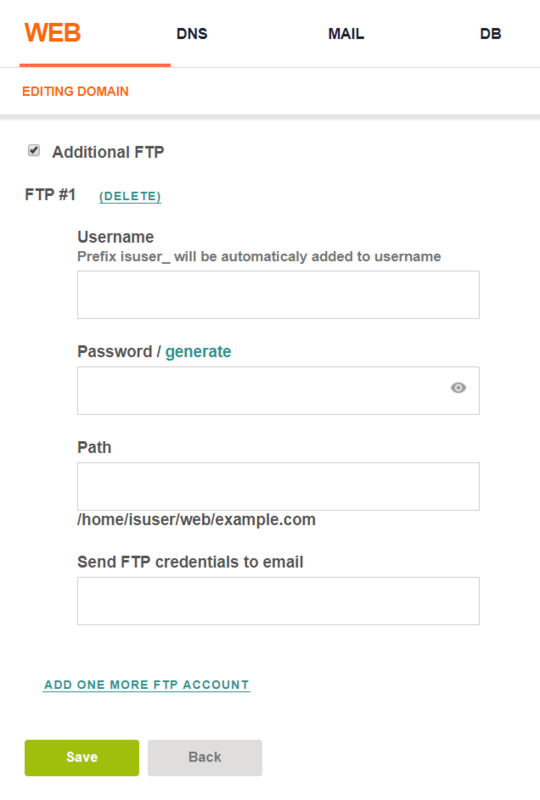 Select the domain to which you need to add an additional FTP account, and click the ‘Edit’ button. Scroll down and check ‘Additional FTP’ option. Fill in the Username and Password fields. A prefix will be added to the username. Click ‘generate’ for VestaCP to generate a random password for you. Optionally, you can fill in a Path. The user will only be able to access the folder you enter here using this FTP account. It is recommended that you enter an email. VestaCP will send you an email with the login credentials for this FTP account.